It is another crazy weather day here in NH it is pouring and close to 50 degrees out there. What little snow we had should be pretty much gone before tomorrow when it is supposed to get cold again. My husband and son are working on a very large job with a tight deadline and headed off to work this Sunday morning; just for a couple of hours thankfully. One of his workers mentioned since they were getting out early enough; around 10ish that he was going to head home, make some brunch and watch a movie. That totally worked into my plans; I was thinking of making a corned beef hash so I am glad the guys were going to coming home; I wouldn’t have made it for just us girls. I kind of recall having hash a couple of times when I was a kid but I guess I didn’t care for it? Only because I have never made it and have never ordered it out. Side note my husband is watching football and just asked if I was blogging about hash. He said that it was wicked good and mentioned he doesn’t recall ever having it before. Hash also doesn’t sound like the most appealing item on any menu; at least in my opinion. SO I just googled history of hash; first funny thing that caught my attention was that September 27 is national corned beef hash day; who knew 🙂 the next thing is it is derived from the French verb hacher (to chop). Yes everything is chopped and it helps that they are similar in size so they all cook up around the same time. It also said that it became popular during world war II as rationing the limited availability of fresh meat. It makes total sense and I am now on board with hash, I might even order a side of it next time we go out to breakfast. This morning my hash consisted of potatoes, onions and corned beef. It probably should have had beef stock but I had some open chicken stock in the fridge so I used that instead. A few weeks ago our WWW World Wide Wednesday meal was from Finland and my daughter made a sausage hash that we all loved which was why I was interested in trying corned beef hash. My favorite type of egg is poached but you can do whatever kind you like or leave the egg out entirely. In a hot fry pan melt the butter and olive oil together, add the potatoes; salt and pepper to taste. Add the onions and then the beef. Saute till the potatoes are cooked and a nice crust forms on the hash. My daughter Abbi and I were recently looking through the freezer trying to figure out meals for the week. I listed off all the proteins that I had in there. It quickly donned on me that as recent as 5 years ago some of what I listed would have NEVER been in my house let alone in my freezer waiting for me to cook. Lamb chops – they are for the guys. Salmon I really want to like it, it just hasn’t happened yet. Some Bangers from a local pig farm that just need a little mash to go along the side, and even some pork belly just screaming at me to make pork belly steamed buns. There are also some things that used to be in my cupboard that I haven’t purchased in many years. I love scalloped potatoes and since my husband thinks he is a potato farmer we have a lot of potatoes on hand. 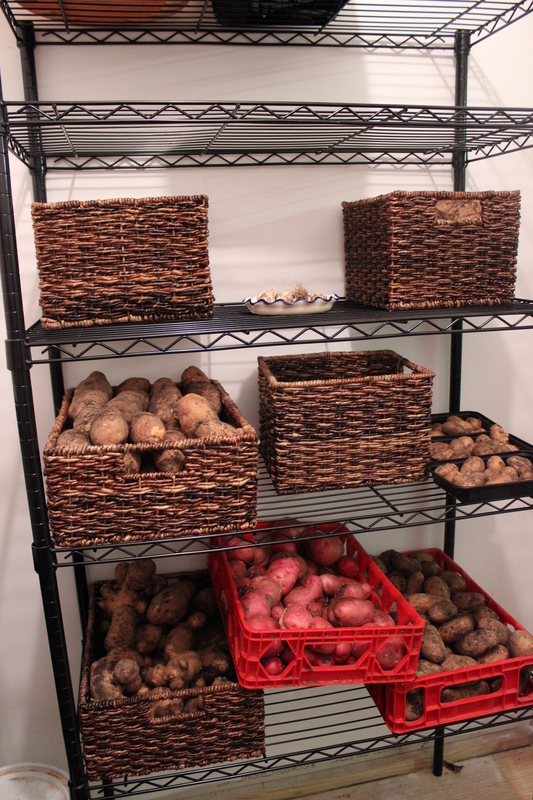 Thankfully when stored properly his harvest lasts many months and we don’t have to eat them every day. While there are many ways to prepare potatoes I feel we sometimes get into a little potato rut on occasion, one of my daughters favorite comfort food is mashed potato and when she arrived home recently from her 2 year stint in Japan she wanted mashed potatoes with every meal and I am pretty sure we had them 3 or 4 times in the first week she was home. I do know that scalloped can take a little more effort than mashed, there cheesy goodness cannot be denied. If you are looking for something a little different tonight I don’t think you will be disappointed and will find it pretty easy to make. And if there are any leftovers, they are amazing! 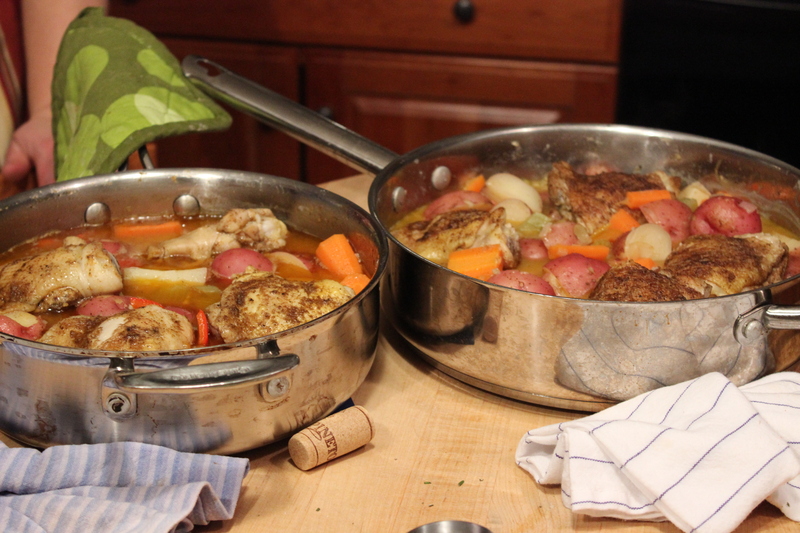 I had a cooking class last week where we made 3 different chicken dishes. We made Harvest Roasted Chicken, Skillet Chicken and Chicken Cordon Bleu. 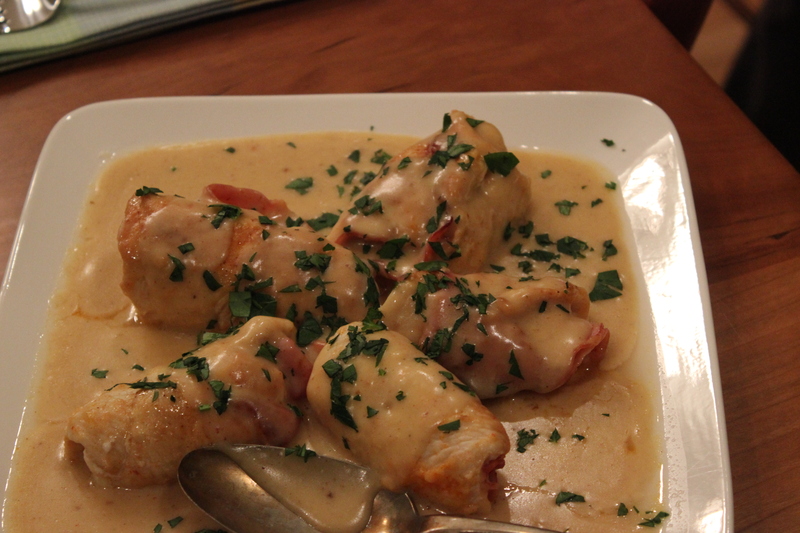 I had blogged a few weeks ago about the Chicken Cordon Bleu it was a huge hit as I knew it would be the white wine sauce is just that awesome!!! I had 4 attendees at this class; 2 have come to previous classes and there were 2 new students. I always find it quite comical some of the things I end up sharing with the class. The cutting of an onion is always something new that we practice, this particular class we set a timer for searing chicken so they would leave it alone and let it brown. Another tip shared was if you try to flip the meat and it doesn’t release from the pan to leave it alone. Once it releases than you can turn it over. One student couldn’t believe how long 5 minutes truly was; everyone wants to flip before its time. I see it ALL the time. Let it set and get all yummy before flipping!!! My daughter arrived from Japan Friday night for a 12 day visit. SO excited to see her after her being gone for 8 months; we will be having several of her favorite meals while she is home. She has already had mashed potatoes each of the 3 days of her being home in America. 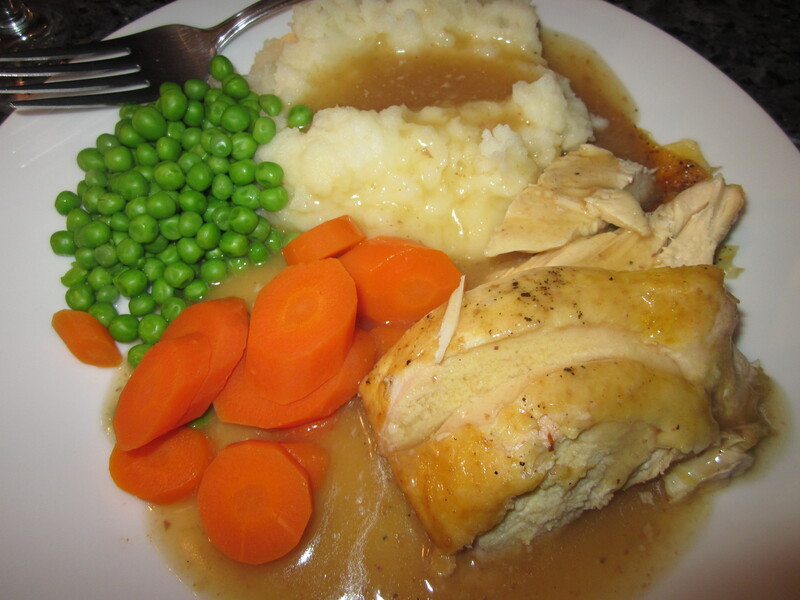 We literally just finished eating a roasted chicken, mashed potatoes, carrots, peas and gravy for Sunday dinner. 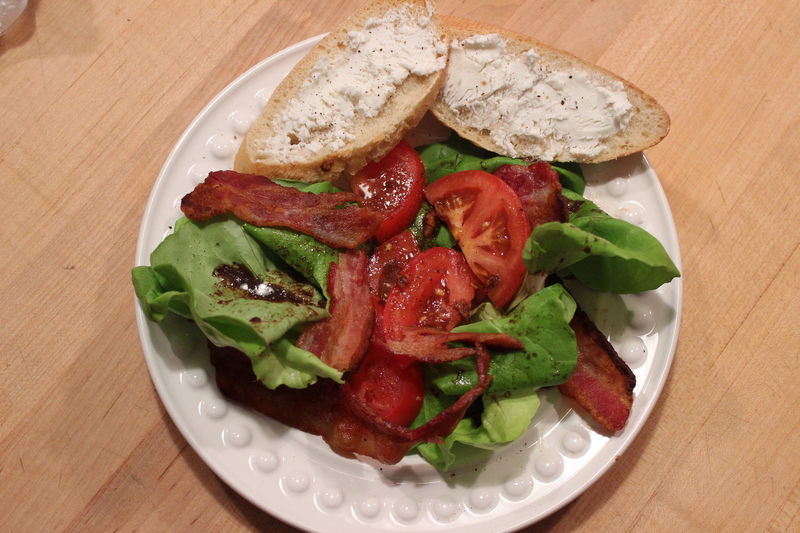 Some of the things that she can either not get or it does not taste like it does here in the states, is bacon, steak and burger. We are all SO excited she is here and are looking forward to hearing all her stories. Heat oil in a large heavy skillet over medium-high heat, add chicken (skin side down) cook until chicken is browned, about 3 minutes per side. Transfer chicken to plate, set aside. Add potatoes, onions, carrots, celery, garlic and bell pepper to skillet. Cook and stir 3-5 minutes. Sprinkle flour over vegetables and stir to coat. Slowly stir in chicken broth and wine. Scraping up browned bits from the bottom of skillet bring to a boil, stirring often. Reduce heat to medium-low. Place chicken back into skillet. Cover and cook about 30 minutes, or until chicken is done and juices run clear. Increase heat to medium-high and cook, uncovered about 5 minutes or until sauce is thickened Season to taste with salt and pepper. Sprinkle with parsley before serving. Super busy weekend AGAIN…I am not complaing – just tired and stuffy today! Dinner out at MT’s in Nashua Friday night, I am going to try my hand at making their yummy sweet and salty wings. They have no breading on them, they are baked not fried and they have maple syrup with a bacon crumble on top. They are simply divine!!! Bought some new skis at our local mountain ski swap; ran to Nashua again for material, I have a baby shower coming up this weekend and I am going to make large versions of receiving blankets. Everyone loves them; at least that is what I keep hearing! Off to VT (supposed to leave at 2, I didn’t get home till almost 3) to our good friends to have dinner and see their newly built addition. It looks great by the way; it looks like it has always been there; not an afterthought which can happen with addition’s – Nice Job!!!! Someone; and I won’t name names; had a little too much wine to drink Saturday night, the next morning after we all woke up and the coffee had been made; this particular someone disappeared; he was found sleeping in the car with his sunglasses on covered with a blanket – kind of funny!!! Only because it wasn’t me… You should have seen the look on his face when we mentioned we were going to breakfast at Sugar and Spice, priceless! He did feel better after eating, but it took a little while! The maple syrup for my buttermilk pancakes (they make their own) reminded me of the wings from Friday night. Food full circle for me – when I have time; hopefully soon; I will be writing about sweet and salty wings. After breakfast we rushed home for my husband’s Uncles 86th b-day party. By the time we got home tonight I was exhausted and thanks to my son; he gave me his cold; my head is very foggy! Forgive me if I do not make any sense today! 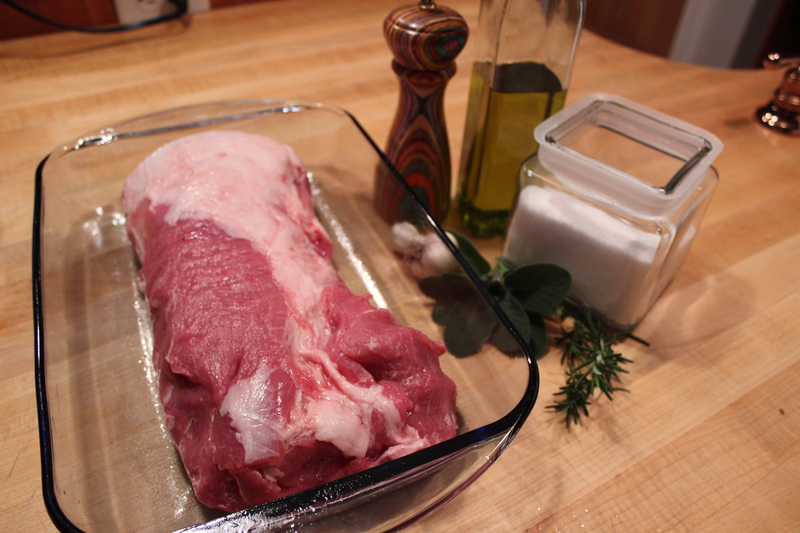 Another weekend without grocery shopping and the only thing that I could make quickly was a center cut boneless pork loin. Probably doesn’t sound like a quick simple thing to fix but since I still have some herbs in the garden that have not been lost yet to the weather, and thanks to the harvest this year, we have potatoes, garlic and beets – Voila! Garlic and Herb crusted pork loin, mashed potatoes and Beets! 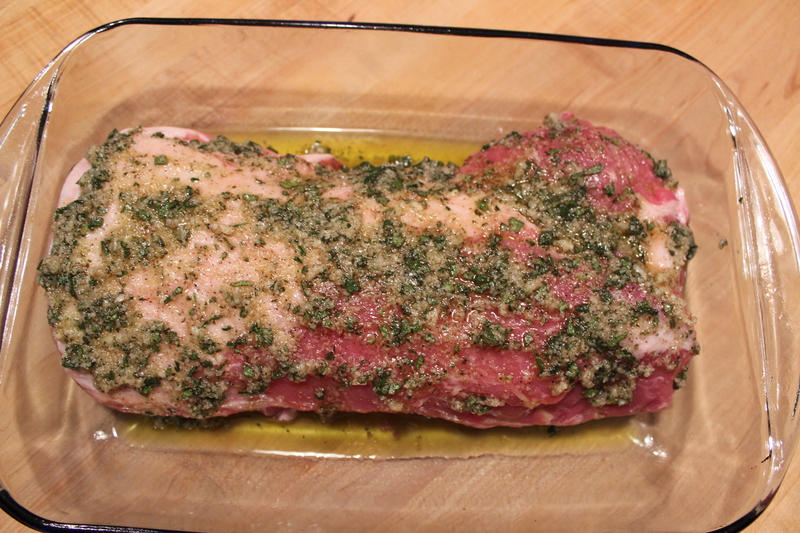 place pork in a low sided roasting pan – cover with paste mixture – place in over for 20 mintues, lower heat to 300′ and continue roasting for another 20-30 minutes – an instant read meat thermometer should reach 145′. Everyone’s oven is different so a meat thermometer will be one of your best tools, these times are what I used for my 4lb loin. 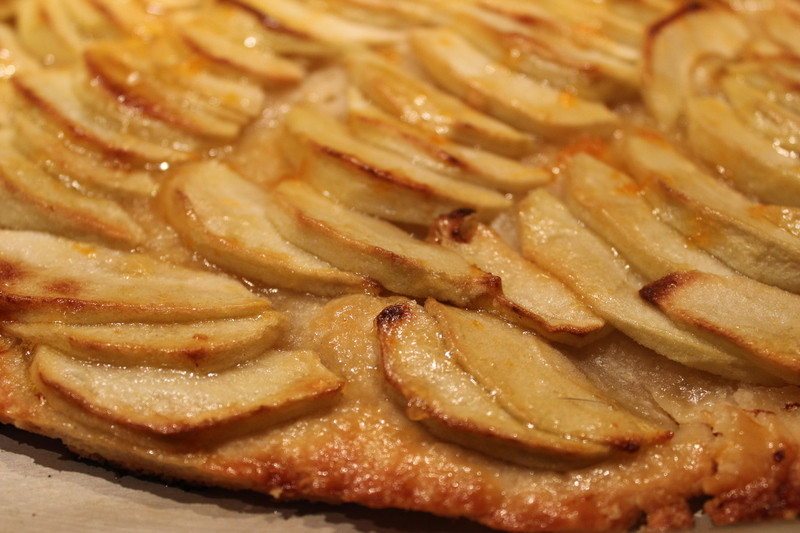 Tent with tinfoil and let sit for 10 mintues before slicing – YUM! While I am not a great gardener; as you can tell by the photo I just took, one garden looks great the other not so much! I do try to do my best. Before I buy what I want to plant, I make a listing of everything we tend to eat and the herbs we use a lot. I used to start the seeds in the house but I have been buying my plants for probably the last 10 years. I find it easier, kind of the instant gratification that I tend to need. Nothing like spending the day laying out all the plants, planting them and voila a garden!!! I always plant the staples to make homemade salsa, green peppers, tomatoes, jalapeno peppers, onions, garlic of course, and cilantro. As well as things I can go out harvest and make a yummy salad or grab some herbs for seasoning our dinners; chives, thyme, basil, parsley, sage and rosemary are my favorite go to herbs. I find it so gratifying going out into the garden and grabbing some zucchini and summer squash slice them up and cook them on the grill. Sometimes in a foil packet sometimes just in rounds on the grill always with olive oil, onions and or garlic and Kosher salt and fresh black pepper. I am very grateful my family likes that I cook them to al dente, not a fan of the over cooked mush that I see on occasion. 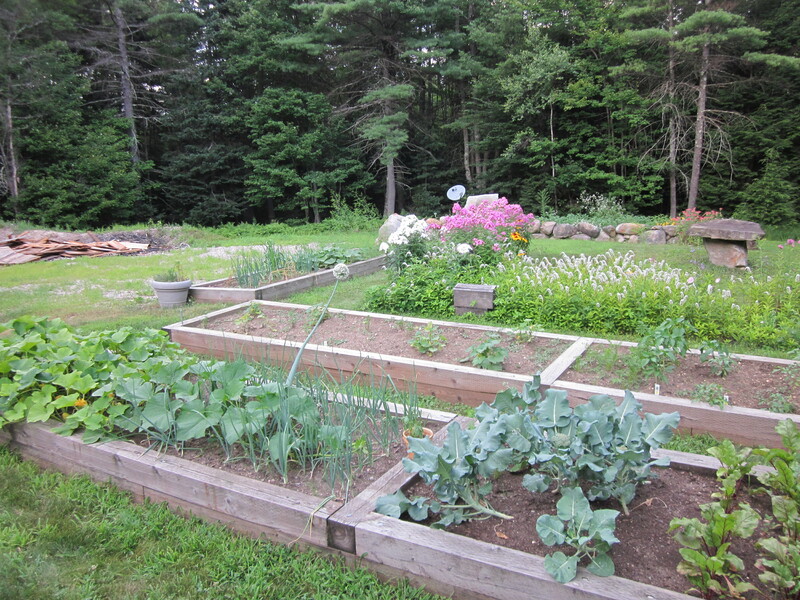 My husband and I have had a garden in some fashion for 25+ years (my favorites are raised beds hand downs) I am almost embarrassed to say that out loud, you would think that after that many years I wouldn’t lose a plant or an entire crop as I have on occasion. Not positive it is always entirely my fault; I water, weed, fertilize and do what I can to nurture them, if something is looking amiss I research what it needs and try to rectify the problem. I am not always successful. Some years we have an abundance of tomatoes; next year it will be cucumbers, one year carrots. I don’t change how I plant them; we do change where in the garden we plant them. So I am at a loss. I am going to go with the wonderfully ever changing New England weather we have. I will confess; much to my husbands dismay; I have banned corn from our raised beds, while I love corn on the cob it takes up a lot of real estate and the harvest from our gardens over the years isn’t really worth it. If my husband had his way, he would have an acre of corn. I didn’t actually say no to this, I just told him he needed to find his own acre somewhere else. This year he now has found another plant that we have had a tremendous amount of luck with over the years so now he is focused on growing potatoes; my carpenter husband is now proclaiming he wants to be a potato farmer. Sometimes you need to just nod and smile. I think he thinks he can make vodka; he doesn’t even like vodka; I am the one that drinks it. I have never heard of New Hampshire based vodka but I guess you never know unless you try. New this season Potato garden! We all LOVE potatoes; fresh from the garden potatoes are definitely worth a spot in your garden at least once. I think my favorite way is roasting them in the oven or even on the grill. Olive oil, Kosher Salt, Freshly ground black pepper and Rosemary – YUM! 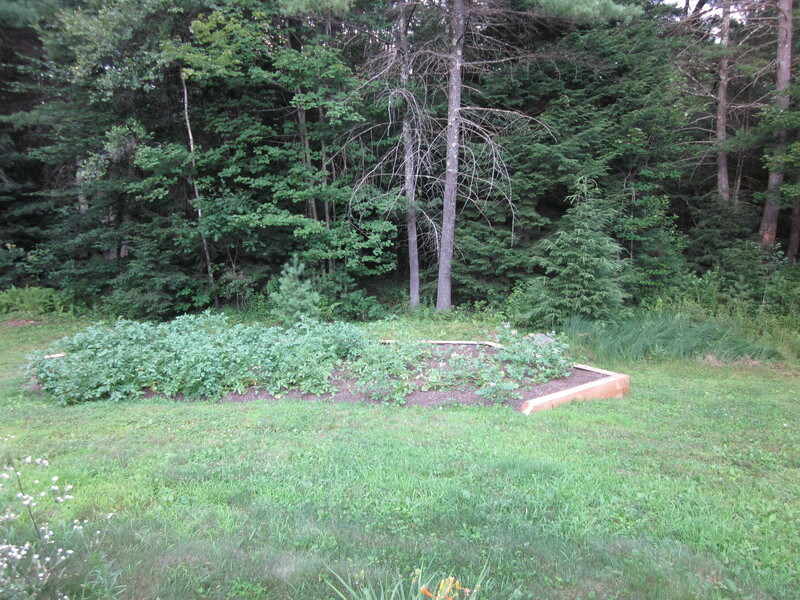 My husband made a new larger raised bed for his potatoes, his plants are looking better than some of mine. You just never know!!! 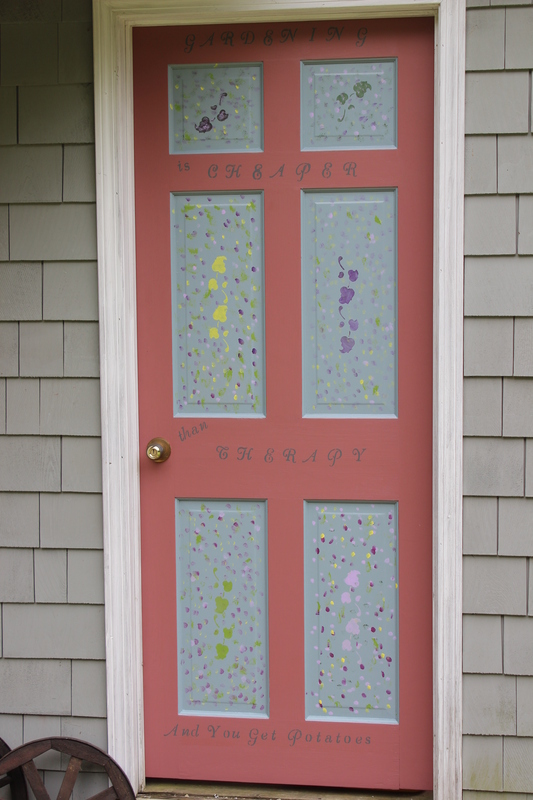 There is a door into the shed that is off of my potting bench – It was a very ugly green that I have no idea why we even owned the color of paint. It was driving me nuts for a couple of years now, I decided a few weeks ago that I was going to paint it. I figured it was not going to be seen by anyone but me and whoever helps me in the garden, so I decided to go a little crazy for me. I did use a famous motto about gardening but changed it to Potatoes for my husband. He loves it!!!! I love taking a medley of veggies from the garden; carrots, potatoes, beets and butternut squash, chop them up add olive oil and Kosher salt fresh cracked black pepper and put them out on the grill on one of my old cookie sheets. Turn them a couple of times and they taste just amazing. They are wonderful side to any meat you want to pair them with. Sweet smoky flavor that melt in your mouth. When I do have too many vegetables to eat and give away before rotting, I do pickle my cucumbers. I also will make tomato sauce or I chop and seed them and freeze so I can add to just about anything soups, stews or sauces. I make garden salsa all the time and I have canned batches of that over the years; I used to send my daughter to college with a jar or two. I am not entirely sure what to do with the bazillion jalapeno peppers we get, I do use them but while we like some heat in dishes, we are not super heat lovers. I do end up bringing quite a few of them to work to share. This year I will need to look up what to do with them! If we could grow avocado’s I would be in garden heaven – we LOVE guacamole and the only thing I need to buy from the store is the avocado, I guess that isn’t too bad! Dice and seed the tomatoes and set aside to drain while you dice the peppers and onions, press the garlic, and chop the cilantro. Mix everything together add a dash of balsamic vinegar, salt and pepper to taste and a packet or two of sweet and low. Hint 1: you can make it hotter by leaving the pith and seeds in the jalapenos or milder by removing them before chopping. 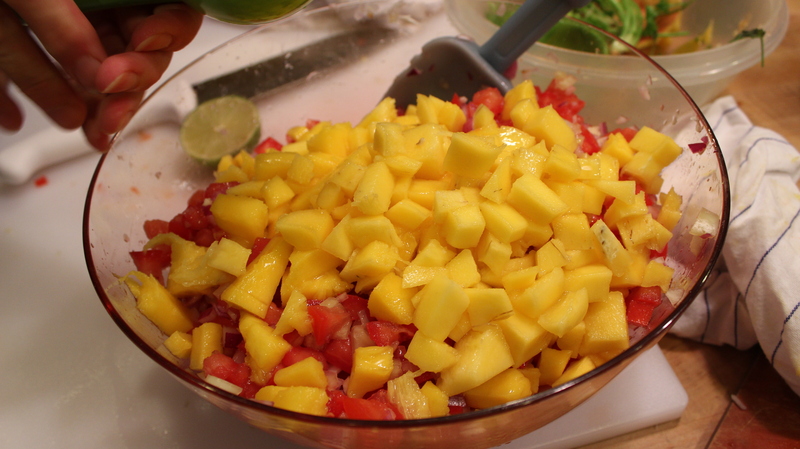 In a medium bowl combine the mango, avocado, tomatoes, jalapeno, cilantro and garlic. In a small bowl add the onion and lime juice, let it site for 5 minutes, whisk in olive oil, season with salt. 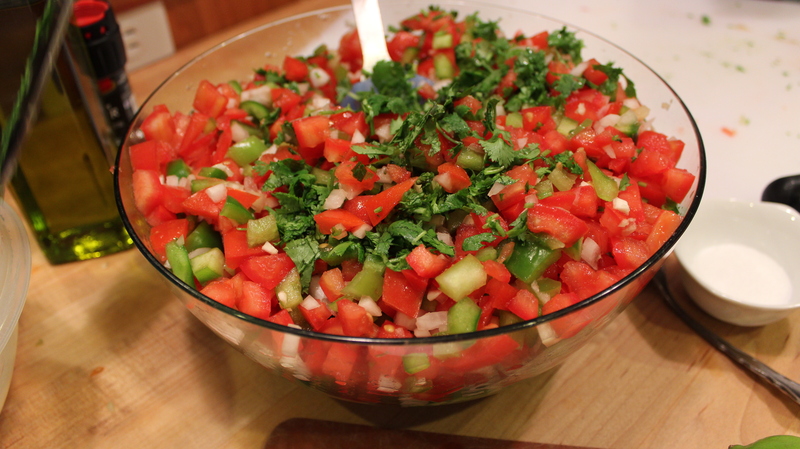 Fold the dressing into the salsa and refrigerate for 30 minutes before serving. My roasted potato, carrots and rosemary are almost ready for dinner….